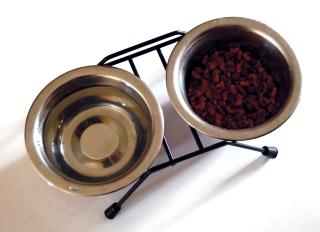 With tough economic times and the high price of pet food, feeding your pet a healthy diet can be a challenge. However, it's possible to feed your pet a healthy diet by knowing what to look out for. More expensive food doesn't always mean healthy pet food, so it's important to know how to choose healthy food for your pet. One of the most important parts of the label is the ingredients list, but it's not the only part owners should pay attention to. The nutritional adequacy statement and the title of the food are also important. The label should state that it has been approved by the AAFCO (Association of American Feed Control Officials). Foods approved by the AAFCO have to adhere to certain nutritional guidelines before they can legally place the label on their food. If you're feeding a cat or dog, meat should be listed as the first ingredients. Cats are carnivorous while dogs are closer to omnivores, however, both need a good source of meat based protein. Look for ingredients like chicken, beef, fish, lamb, or poultry. Avoid vague statements such as "meat" or "animal fat". Wheat, corn, and fillers should be listed towards the bottom of the ingredients list or not at all. Be on the look out for repeat ingredients. For instance, some manufacturers will list corn as three separate things, such as corn meal, ground corn, and corn gluten to make it appear lower in the ingredients list. A vet can probably recommend foods based on your pet's specific needs. For instance, if your pet has certain allergies or is prone to certain illnesses, a vet can recommend food to address those specific needs. Buying organic can guarantee that, at the very least, your pet is getting all natural ingredients. Look for the USDA organic label on the bag. This guarantees that the ingredients contained are at least 95% organic. The food won't contain antibiotics, pesticides, or chemical preservatives. Instead, it's preserved with natural substances such as Vitamin C and E. For a good organic pet food, try Castor & Pollux Organix Adult Dog Food for dogs and Castor & Pollux Organix Feline Formula for cats. Note that organic pet food can get quite a bit pricier. However, if organic isn't your thing there's always the option of making your own pet food, or feeding your pet a raw diet, just be sure to do your research. Pet food companies don't market to the pet, they market to the owner. What this means is that they try to target what humans think is good, rather than what's actually best for your pet. For this reason, it's important to stay educated about your pet's needs and always check the label. Don't just listen to the advertisements or look at the price tag. This goes for more expensive foods, too. Pricier doesn't always mean better. So, do your research, be educated, and feed your pet the best food possible. 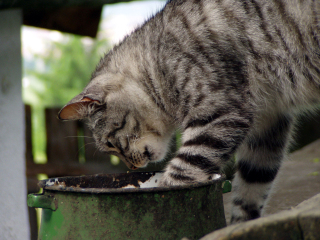 With these tips, owners should at least have a basic idea of what to feed their pets. Remember to keep an eye on your pet during diet changes, and take him to the vet if he shows any signs of allergies or illness. PediPaws: The Best Way to Trim Your Pet's Nails?